- During assembling, please make sure the corners of the meshes are inserted into the bottom of the connectors entirely to add security. - Connect two wire meshes to the structure side by side with 2 cable ties. 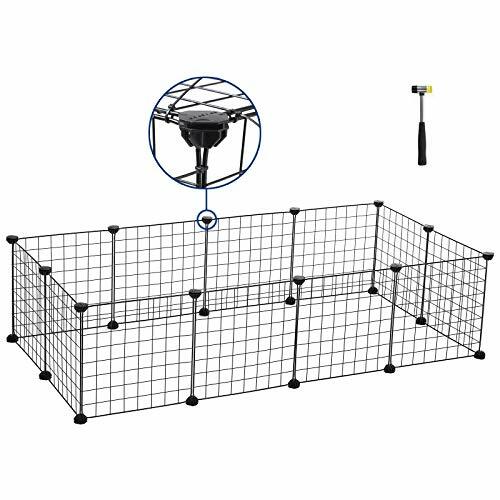 - This fence is light and only to be used for small animals (guinea pig, hamster, hedgehog, lizard, etc), we do not recommend to use it for large animals such as dogs, cats. etc. UPGRADE VERSION: Cable Ties and Non-slip Mats added in.Cable tie enclosure ensures good stability and security of the playpen. Thanks to the non-slip mats, the product holds up well on the floor and also protect your floor from scratches.